This article, originally posted here, and reposted with permission, seeks to point those interested in conducted, leading, or simply participating in your company’s digital transformation, in the direction of some tools that I have discovered working as the Manager for IT University of Copenhagen’s Business Innovation Lab that are not only based in scientific research but approachable from a business perspective. Today, the calls for Digital Transformation can be heard coming from nearly every nook & cranny of practically every industry. Evolve or die, as the newly christened adage goes. But why is digital transformation important? And as an organization how do we know we are doing it right? Many organizations already claim to be undergoing a digital transformation. The most prevalent proof of this is adopting more agile methods of working and collaborating. But a look under the hood, often times reveals, something else entirely — doing waterfall in an agile manner – which as many studies show, rarely ends well. Digital transformation is important now because what constituted a successful business model or best practices in the past are becoming or have already become irrelevant. In the past, organizations were mainly organization-centric, focusing on getting it right internally before releasing products and service to the market. Digital-Native organizations are customer-centric, releasing products early and often and able to incorporate customer feedback into future iterations of their products and services. Because of this difference, the hard work of traditional organizations spend developing a competitive advantage over years, decades even, can be swiped off the map by a start-up that is digitally native, equipped with a digital business model and a culture of customer-centricity. But never fear! 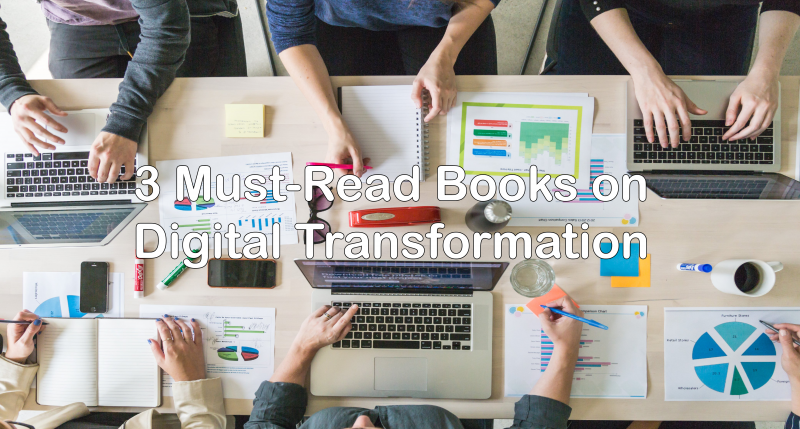 Because the research that has been in done in the field of Digital Transformation is wide and deep, and thanks to these great authors, you don’t have read every peer-reviewed article on the subject to become a change agent: no matter your position in your organization. 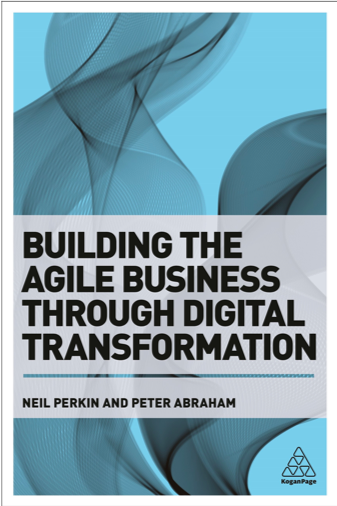 This first book, published in 2017, is an excellent place to start if you are an executive in a large organization and are interested in jump-starting your organization’s digital transformation. What I love about this book is that mentions in a very applicable and approachable way nearly every academic article I read while obtaining my Master’s Degree in Digital Innovation & Management. Everything from Schumpeter’s ‘gale of creative destruction’ to Boston Consulting Group’s DICE mathematical formula for accessing the risk of failure in program execution, this book dives into the depth of knowledge available to define agility, present agile innovation processes, and turn the corner to achieve the cultural change necessary to successfully transform your organization to a Digital-Native. Perkin, N., & Abraham, P. (2017). Building the agile business through digital transformation. Kogan Page Publishers. 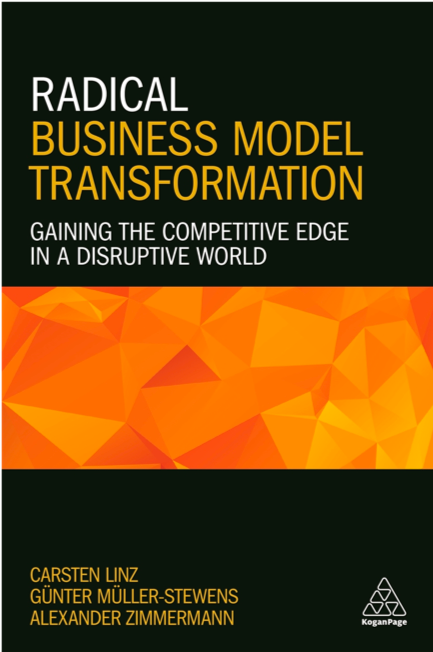 This book is can be a vital tool for executive management used to understand the weaknesses of current business models in the face of industry disruption. Published in 2017, Radical Business Model Transformation offers tools to shift resources and adapt current business practices to bake resilience into new business models and minimize risk in an uncertain environment. Business model transformation is the prevailing theme of the modern economy. This is required reading for anyone who wants to learn how innovation can create new opportunity & growth. Linz, C., Müller-Stewens, G., & Zimmermann, A. (2017) Radical Business Model Transformation: Gaining the Competitive Edge in a Disruptive World. Kogan Page Publishers. This last book is geared towards employees in an organization as opposed to the first two which are focused on helping business leaders understand the problem digital transformation sets out to solve. Transform is from 2016 and is meant to empower employees who may have a more digital-native mindset than that of the culture of the organization within which they operate, hence the idea of a rebel’s guide. The hierarchy, the status-quo, these concepts are, by definition, change averse. McGovern posits that upper management has been overvalued and over-paid for decades and because of this fact, they will be, as a whole, unwilling to jeopardize this current reality in the name of survival. Therefore, this book can also offer inspiration to rebel leaders in organizations who can recognize the importance of digital transformation in the face of disruptive innovation. McGovern, G. (2016). 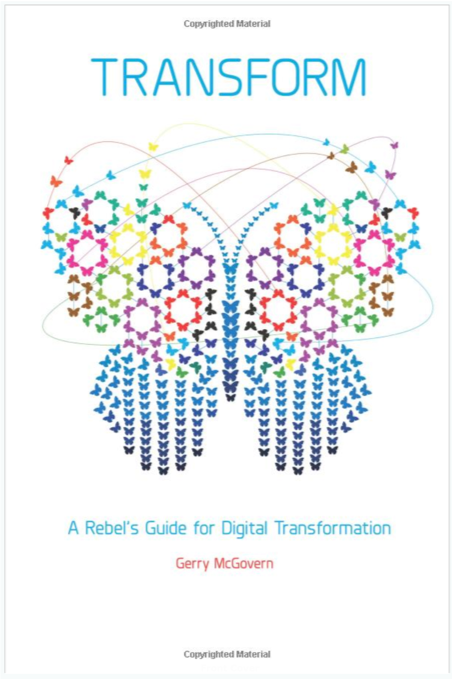 Transform: A Rebel’s Guide for Digital Transformation. Silvwe Beach Publishing. The method is made up of roles, event, and artefacts, all of which are clearly defined and work together to produce frequent product increments that can be used and assessed by stakeholders long before the project comes to an end. This ensures not only that expectations are continuously understood by all stakeholders, but also that that which is being developed will in fact have impact and create value for the clients and the ends users. It has roots in software development, dating back several decades, but today you can find this process framework has transcended its origins and has taken root has a widely applicable project management methodology. Scrum has three pillars: Transparency, Inspection, and Adaption. Transparency is important due to the self-organizing nature of the scum method, no matter your role on the team the process must be visible so that you can have a sense of shared ownership in outcomes. Inspection requires that all team members inspect project artefacts and the progress being made towards a sprint goal. This can detect variances and misalignments during the course of sprint rather than having to wait until the sprint review with stakeholders. Adaption is an essential piece to scrum because it informs the iterative nature of the process. The expectation is that if the project is veering off course, team members must be ready to adapt and change course. With these pillars and an understanding of the artefacts, roles, and events of scrum you are ready to spring into action and be a part of your organization’s agile transformation. If you want to learn more about the benefits of working agile, check out this blogpost. A scrum team is made up of anywhere between 5 – 11 members. While each scrum team will only have one Product Owner and one Scrum Master, the diversity of the skills required will dictate the number of development team members. It is important to note that there is no hierarchy in the team, all are equal and all are responsible. Product Owner: This person is responsible for ROI, product vision, and prioritizing the backlog. This person works closely with the business side and the stakeholders. An apt metaphor for this position would be that of a Foreign Minister, responsible for communicating with those outside of the product team. Scrum Master:To continue this metaphor, the Scrum Master is the Interior Minister and is responsible for managing communication within the team. More than that the Scrum Master is there to facilitate the scrum process, which in many cases amounts to removing barriers and obstacles that could impede the team from doing their work. This person also capture the empirical data to produce the burndown chart — an artifact that keeps the work towards the end goal visible and can signal missed deadlines before they hit. Development Team: All other team members are a part of the development team and they are a cross functional group which encompasses all the necessary skills to complete the project. Artefacts are used within the scrum method to ensure transparency. Artefacts include; product backlog, sprint backlog, and product increments. Product Backlog: A list of requirements written from the perspective of users. This list can be continuously updated and refined. Sprint Backlog: A list of the development team’s work for a sprint which emerges in Sprint Planning. Product Increment: a.k.a. DoD or Definition of Done is a functional representation of the work completed within a particular sprint which is shared with the business and stakeholders at the Sprint Review. 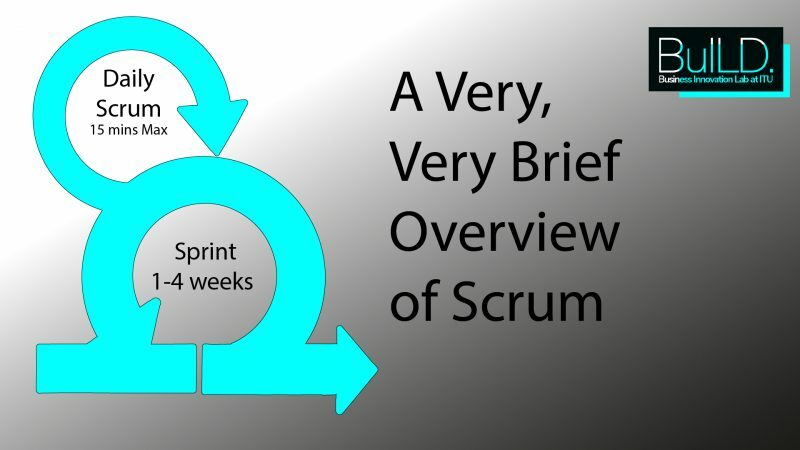 This section will briefly describe the events which make up Scrum: Sprints, Sprint Planning, Daily Scrum, Sprint Review & Sprint Retrospective. Work is carried out in 1 to 4 week sprints, or time-boxed, wherein the Scrum Team works towards the creation of a working product, known as an Incremental Product Release. A new sprint begin immediately following the conclusion of the previous sprint. Spring contain the following events: Sprint Planning, Daily Scrum, Sprint Review & Sprint Retrospective. What is known as requirements specification in traditional development projects is encapsulated in the product backlog. This prioritized list is curated by Product Owner. During each sprint, the team works through the sprint backlog which is the team’s prioritized tasks for each sprint. Through the use of user stories and epics, the team collectively estimates the amount of hours to be spent on the tasks making up the sprint backlog and the relative value each will produce. What makes scrum so special is its focus on consistently delivering working products that can immediately translate into creating value long before the project is completed. These MVP like products are an excellent way to ensure the project is on track and will produce value for stakeholders from day 1. Daily scrum are short meetings (no more than 15mins!!) where the pillars of scrum can be seen at work. The meetings are held at the same time each day and preferably in the same place where work is inspected and synchronized, and any impediments are revealed. If adaption is necessary then follow-on meetings may be made after the Daily Scrum. Once the sprint is completed the team invites the stakeholders in to inspect the product of the sprint. Remember the product must be functional. This is an opportunity for team members only to discuss the previous sprint and is facilitated by the Scrum Master. Possible changes and adaptions for upcoming sprints are discussed here. Going agile should not be taken lightly and it requires full buy-in not only from employees and upper management but middle management as well. To alleviate the stress that a new working perspective can have on middle management consider closely vetting incoming candidates for their proven ability working agile and offer current employees opportunities to get educated and certified in Scrum and SAFe. This is why BuILD has taken such an interest in this method, because doing so can create value for our passionate and career-driven students while also creating value for the organizations with which we and our students collaborate with. Together we are preparing to face the challenges of the Digital Age and together we learning and growing.